This newly constructed training center and adjoining Yachana Lodge, an eco-lodge school, are the culmination of the Yachana Foundation’s 24 years’ experience in community-based solutions to poverty and environmental conservation along the Napo River in Ecuador’s Amazon region. US born Douglas McMeekin struggled without support for his dyslexia to succeed in earning his BA at age 28. In 1986, following business failures in Kentucky, he visited friends in Ecuador. He became aware and appreciative of the wealth of knowledge of the indigenous peoples. Intuitively he realized his purpose was to contribute to solving the social and environmental problems in the Amazon. He founded the Yachana Foundation in 1991. Yachana in Quichua language means “place of learning”. Failures of the existing bureaucratic educational system and its prejudice against indigenous and rural children focused his efforts to education of the youth. The foundation has improved lives through: building local community schools, health clinics, pharmacies, agricultural organizations, micro-finance projects, environmental sustainability programs, eco-tourism management and community development initiatives. 25 computers with LED screens and 514 watts total energy consumption with low heat production as a side benefit. The hotel school is Ecuador’s only eco-lodge that trains Amazon youth in hotel management and leadership and has received numerous eco-tourism awards. In close co-operation with the Ecuadoran Minister of Education, it employees certified teachers who provide long weekend classes in basic academic subjects preparing learners to meet traditional high school diploma requirements. 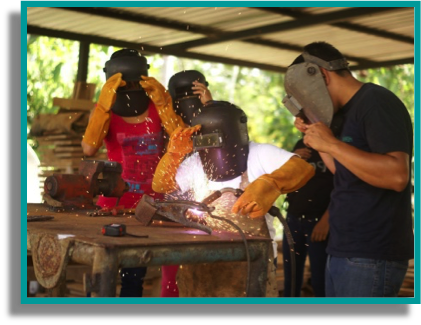 Combined, these efforts develop leadership and technical skills that enable Amazon youth to remain in the rain forest region, find work or be entrepreneurs: a concept that could serve many remote regions around the globe. Ecuador’s Minister of Education currently cannot meet the minimum requirements established by law in the remote rainforest and fails to serve this portion of its youth; a gap Yachana may well succeed in fulfilling.